Where does your rod licence money go? I’m often asked “why do I need to buy a rod licence, what do I get for my £27?” Apart from it being the law for anyone fishing for migratory and freshwater fish, the income from rod licence sales funds vital work to protect and improve England’s fisheries. Last year we raised around £23 million from more than 1 million anglers. So, what does £23 million buy? First of all, and the bit of the business I’m most closely involved with, is making sure we have the right fishing regulations – close seasons, prohibited methods and other byelaws – to protect fish stocks. Believe it or not, legislation can be exciting. It’s also the cornerstone of all our work. Significant advances are bag limits to protect coarse fish, carcass tags to disrupt salmon poaching and we are currently working with government on new rules to regulate live fish transfers to control fish diseases. “Legislation without enforcement is just good advice.” And not everyone is willing to heed advice, no matter how good it is. We work with the police, fishery owners and others to detect, deter and enforce against illegal fishing. This year, we reported 124 close season offences from 673 patrols. We respond to reports of illegal fishing and only last week arrested 2 anglers on the River Severn, suspected of fishing with illegal set lines. Earlier this month, we prosecuted an angler for using a set line to take trout from the River Yare. What do you get for your rod licence? We are on duty 24 hours a day to respond to fish kills and fish in distress. Our fisheries teams are trained to use aeration equipment or hydrogen peroxide to restore dissolved oxygen levels. When necessary, we will rescue and transfer fish to safety, as we did when winter floodwaters left fish stranded on Worcester racecourse. We also investigate fish mortalities and check live fish transfers for signs of disease. Our Calverton fish farm rears top quality coarse fish to restock rivers and to replace fish lost in pollution incidents (although we will always aim to make the polluter pay for the latter). Each year, Calverton produces around 450,000 chub, dace, barbel, roach and grayling. And it’s not just putting fish into fisheries... sometimes we have to take them out. Invasive non-native species can pose serious risks to native fish, often completely taking over a fishery. We’ve removed topmouth gudgeon from several fisheries recently and, in May, we eradicated the only known population of black bullhead from a water in Hertfordshire. Cormorants and otters can harm fisheries. We work with fishery owners to erect fencing to exclude otters and place submerged refuges in fisheries to reduce cormorant predation. This year, the Angling Trust used rod licence income to employ three Fisheries Management Advisors to help coordinate the efforts of local fishery managers and owners to manage cormorant predation on their waters. It is widely recognised that fishing can enhance and change people’s lives. We work with others to improve access to rivers for fishing. For example, we recently improved facilities on the River Teme. We also fund the Angling Trust and other partners to get more people fishing, through the National Angling Strategy. National Fishing Month and Family Fishing both give youngsters and families an opportunity to try out the sport, and a new website, www.fishinginfo.co.uk, gives new and experienced anglers information on where to fish, angling weather, river levels and more – all paid for by rod licence income. So, what do you get for your rod licence? The right laws enforced; an emergency response; healthy fish stocks in a good quality environment; and a sustainable future for angling. so why is it having bought a licence since an age when I had to, can I not now find a barbel on th wensum........? Can someone explain to me why otters were introduced on the wensum? its not th otters fault, but tell that to th barbel!? Thank you for your blog regarding Otters. “Otters are a protected species. In the 1970s otters were absent from much of Wales and most of England. Therefore, on the whole, the return of otters to our rivers is good news. It reflects improvements in river habitats and water quality, which are now at their healthiest for more than 20 years. Given that numbers are still recovering, otters are legally protected. They cannot be killed, harmed or disturbed without a licence from Natural England. Harming an otter without a license is a criminal offence. Therefore, controlling otter numbers through culling or other means is not an option, unless, in exceptional circumstances, all other alternatives have been exhausted. However, we take concerns about otter predation very seriously. We work closely with fishery owners and managers to help protect their stocks from predators where we can. We put money aside each year from rod licence funds to help install otter fencing where it is needed. Contrary to popular opinion, no captive-bred otters have been released since 1999. The vast majority of otters in England and Wales are the result of natural re-colonisation. Daniel Taylor questioned the lifespan of otters. Most research has shown it unusual for otters to live beyond 6 years in the wild. Some will live for longer, up to 10 years or more, but these are the exception. We continue to look at ways to address the concerns of anglers, working with the Angling Trust and Natural England. The information on our website has been produced jointly with Natural England and the Angling Trust, who represent the views of anglers to government. This information has been put together to help anglers understand the issues surrounding otters, and our role in dealing with these. Last month at Siblyback Res in Cornwall I extremely surprised to be asked to show my fishing licence. The disappointing fact is I have been regularly fishing for nearly 50 years and the only previous time it was checked was around 30 years ago! How can such a poor track record on enforcement be considered a success? If you can successfully recover your costs with prosecutions surely you should have many more inspectors. Thank you for your blog regarding checking of rod licences by our enforcement officers. Please see our navigation link to our latest publication on a recent rod licence blitz: https://www.gov.uk/government/news/anglers-caught-in-fishing-licence-blitz. In addition I have posted the navigation link to the Angling Trust web site that offers a little more detail on successful prosecutions: http://www.anglingtrust.net/page.asp?section=1012&sectionTitle=Don%92t+Cheat+on+Angling+%2D+Environment+Agency+February+Prosecutions+List. The monies received from successful prosecutions is not returned to us. The amounts are divided into Court costs, victims of crime costs adn we recover our costs for bringing the prosecution to court, monetary returns to us is minimal. If you believe that an angler is fishing illegally then we would request you contact our incident communication service on: 0800 80 70 60. You can remain anonymous if you wish and you will receive a reference number. Just a thought, I've been fishing since I can remember, I am now 31! Every time I have fished, I have had the relevant rod licence, saying that I've never been asked in my 20+ years of fishing to produce this licence! Surely the government could give private bailiffs the right to check rod licence's at the same time for checking for the water licence or taking payment for day ticket waters?! I would never dream of fishing without a rod licence but I can see why people take the chance when there is such a low checking rate! do you give money to Scotland as they dont have fishing licences? I hope they do not get any.Or are we funding them? 25years and have never been asked to produce a valid fishing licence....not even a check by bailiffs on day ticket waters. most of the rivers where i live are full of weed so we are unable to fish why dont the enviromental agency clean the rivers?? Why is it I buy a fishing license and virtually everywhere in Shropshire requires a day ticket permit as well? Even the local canal which the environmental agency helped to restore and restock, it means my license money was spent on the maintenance and restoration of the canal and I still have to pay to fish it but dog walkers don't need to pay to walk their dog down it and foul up the place, also when I was a kid morda river that runs through Oswestry and Maesbury was fishable and had trout, pike, perch, roach, Rudd, dace, minnows, chub and other species in it now it contains nothing but bullheads and now most of it is out of bounds to fish and the public foot paths that run along side it have been removed and the land sold off to private ownership, why doesn't the E.A build a fishing pond or lake around Oswestry where it could monitor fishing easily, the ex pits that was around here have also been sold off privately and require membership to clubs to fish that costs more money, I can't see where the money is spent around here so why should I need to buy a license? As an angler I want to see an improvement made to accommodate us and improve fishing in my area with the money we spend on licenses which I believe is going up in price next year. Thank you for your comments regarding licences and how the funds are used. The Rod licence sales are the main source of income for our fisheries work. All of the money we receive through rod licensing goes towards this. We do have to prioritize our work and this has to be approved, as this is a vast area to fund and we have limited funding in these times of austerity. Rod licence income is vital for us to continue maintaining fisheries. We need our fisherman to continue to purchase their licences and help fund this amazing activity. rod licence is just a tax but we have to pay it or do we ? As stated in the original post about "Where does your rod licence money go?" you do need to pay for a rod licence as it is a law for anyone fishing for migratory and freshwater fish. The income from the rod licences also funds vital work to protect and improve England’s fisheries. I'd like to refer to the last part of this article......"So, what do you get for your rod licence? The right laws enforced; an emergency response; healthy fish stocks in a good quality environment; and a sustainable future for angling." LAW ENFORCEMENT - I live in Boston, Lincolnshire and I've been checked twice for my license in 35 years! This area hasn't had any enforcement for over 2 years - the nearest enforcement officers for this area are over 2 hours away in Northampton! How can my licence money be spent on law enforcement when there's no enforcement in this area? EMERGENCY RESPONSE - How can you provide a satisfactory emergency response when the nearest enforcement is over 2 hours away? I've recently spoken to someone who reported fish theft - the incident was reported BUT no one from the EA attended the incident! HEALTHY FISH STOCKS - fish stocks in Lincolnshire are depleting at an alarming rate due to fish thefts from rivers and drains and also illegal fishing and poaching! On November 12th 2014 Operation TRAVERSE was set up to combat illegal fishing and fish thefts in Lincolnshire and Cambridgeshire as these are 2 of the hardest hit counties in the UK. What are the EA's future plans to fight this when the enforecement in the area is nil? Operation TRAVERSE NEEDS more enforcement officers - there are miles and miles of waterways in both counties that are suffering badly from illegal fishing and poaching - WHY aren't the EA stepping up enforcement in these counties? Many anglers are refusing to buy licenses because they've simply had enough of paying for a license and seeing no results in return - is this the direction the EA want's to move in? STOCKING AND IMPROVEMENT - not once in this area has stocking taken place to "improve" the fishing on local rivers/drains adjacent to the Boston area. The only time that stocking has taken place is after a major incident such as salt influx into our drainage systems which seems to be a common occurrence! Also, restocking has NEVER taken place to replenish the diminishing stocks that have suffered from poaching and fish theft! As your aware, the ecosystem needs a balance - that balance is no longer there because stocks are depleting without being replaced! I understand that fish surveys take place on each water every 6 years,which includes electrofishing to carry out the surveys. How can the EA keep a balanced ecosystem IF surveys are only carried out every 6 years? Why are these surveys only carried out every 6 years when fish stocks are being decimated on a daily basis - don't you think that the information the EA holds is largely outdated and needs updating more frequently? Surely fish surveys every 6 years doesn't keep the EA up to date on current stock levels? Your last message above contradicts you somewhat...."The income from the rod licences also funds vital work to protect and improve England’s fisheries." This statement simply isn't true within Lincolnshire - there's no enforcement! I've spoken to hundreds of anglers who've never been checked and have NEVER seen any Enforcement Officers in this reason- it simply doesn't happen yet the EA seem to bang the drum that it does! With regards to Operation TRAVERSE - I've set up a facebook group to promote this. If anyone would like anymore information regarding Operation TRAVERSE or details on how to report incidents of poaching,fish thefts or advice on UK laws then please search on facebook for LINCOLNSHIRE AGAINST POACHING - the group is monitored by members of Operation TRAVERSE so all questions will receive the correct answer! Alternatively, please email me lincolnshireagainstpoaching@gmail.com and I'll answer any questions. 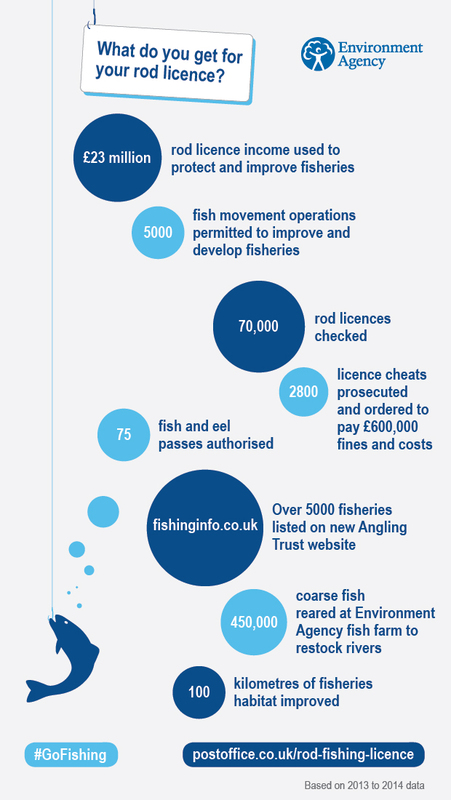 The Rod licence sales are the main source of income for our fisheries work. All of the money we receive through rod licensing goes towards this. We do have to prioritize our work and this has to be approved, as this is a vast area to fund and we have limited funding in these times of austerity. Thanks for your response Margret - even if it was copied and pasted! At least it shows you monitor this site even if you don't bother answering directly!!!! Oh and for anyone that's interested - I've since found out that... "In your Area (Lincolnshire and Northamptonshire) there are currently 3 SAFFA warranted officers. The lead officer is engaged in fisheries enforcement work for 100% of his contracted hours and is based in Northants. He is supported by a further warranted officer based in Northants and one based in Lincolnshire". So that's 3 warranted officers for the whole of Lincolnshire that can legally check licenses AND 2 of these are based in Northamptonshire!!!! what are the plans for dealing with the invasive signal crayfish ? on my local river The Weaver in cheshire i caught over 20 in a 3 hour session , the fish didnt even get a chance to get at my bait before the crayfish did , they have completely ruined this river . Thanks for your question we have sent this to the local fisheries team and will reply once we have further information. I have just read this at the top of your page "I’m often asked “why do I need to buy a rod licence, what do I get for my £27?” Apart from it being the law for anyone fishing for migratory and freshwater fish, the income from rod licence sales funds vital work to protect and improve England’s fisheries"
How come it only says England on it does any of the money go to Wales? I fish on privet property where the EA have not been seen for over 6 years now and that was only to check licences. if I have no intention for fishing a public water way, then why do I need a licence? Another thing is, the rod licence it self only covers you for 2 rods!!!! I have 1 driving licence and can own as many cars as I like!!! This issue needs to be sorted! From what I here on forums it sounds like there's a lot of people on the pay roll that do nothing all for the massive amounts of money they are on. Stop robbing us of are money. There's 64 million people live in England. But your saying only 1 million people brought a licence. Sorry but you can not lie like that!!! There's probable about 1 million carp anglers alone, of which half buy 2 licences!! that's 1.5 million. So that's not including all the match anglers, pike anglers, fly fishing anglers and many more. Think its about time you lot start being more truthful on how much money you receive. Also at least 20% of your managers and team leaders need to be sacked! The truth is on the internet if you look hard enough. Whether you've had your licence checked or not you should be proud of your honesty and contribution to the environment. Well done. Sorry to say ive been trying to buy licence online through post office and keep getting 503 error foor few days now, this is very very poor. We are sorry to hear that you have experienced problems when using the Post Office website to buy a rod licence. The Post Office have said that the website is now up and working and rod licences can be ordered online. I am the same as many anglers commenting here that it is very rare to be asked to show my license but my question is more about what I pay the money for. I never fish on rivers and only ever go to private lakes on fisheries or farms, so why do I need a license? none of the money raised goes to privately run fisheries, they don`t get any of the money and they totally fund all that they do themselves. It is fine for people that fish the rivers, they probably do benefit because the water that they fish is monitored but it is probably mainly the people that use boats on the larger rivers that benefit from the money that I pay, also the game fishing rivers take a lot of the money raised by the course license holders, they get the quality assessments and control that the license fund pays for. I really do not understand exactly why I need a rod license to fish private lakes when I actually get no benefit from it considering that the lake owners also gets no benefit that I can benefit from, in other words, it is a tax that I have to pay by law but does absolutely nothing at all for me. We are required, by law, to have a system of regulating rod and line angling by licences. We use rod licence income to protect and improve all fisheries, both public and private – in fact the majority of fisheries in England are private fisheries whether the fishing is in a river or stillwater. 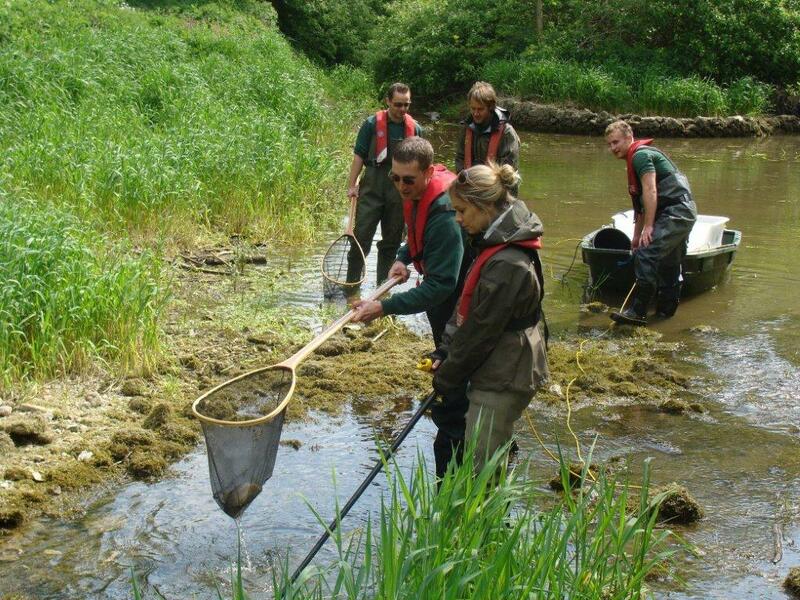 There are many examples of how all fisheries benefit from our rod-licence funded work. One example is fish health. Almost all private stillwater fisheries are stocked. We regulate between 3000-5000 fish movements (stocking and removals) each year. Our fisheries laboratories carry out health checks and mortality investigations to prevent the spread of fish diseases, parasites and invasive non-native species. I only fish privately owned day ticket lakes. I pay the owner who runs and maintains the venue to do so, so why should I have to pay for a licence? I don't understand what business it is of anyone else! Treasury rules state that we must spend all income from rod licences within the financial year. Having the main sales period in April gives us the most time to plan how best to spend it. Having all annual licences running between the same dates means we can concentrate our publicity campaigns and rod licence renewal reminders. This keeps our costs and rod licence fees to a minimum. If we offered rod licences on a rolling basis with different start and end dates, we would need to send reminders and deal with the admin throughout the year. This would result in extra costs that would have to be passed on to anglers. This system was set up following a public consultation in 1994. Short term licences are available for anglers who don't fish regularly. As you say, The Thames Lock and Weir Permits have an age concession price for people that have turned sixty but, if purchased before reaching the age of sixty, a full adult fee would be payable. These permits, like the rod licence, also run from 1st April to 31st March and are not available on a rolling basis. Hi I've just purchased a lake in Suffolk. which I plan to run as a fishery. Do the ea assume rights to check people fishing on my lake? If so can you please state under what law? Also what law states that you need a rod licence? Hello Sam, Thank you for contacting us. Salmon & Freshwater Fisheries Act 1975 sets out the requirement for anglers in freshwater to require a rod licence (section 27). The same Act also provides the powers for our enforcement officers to enter lands for the purpose of preventing any offence under the Act (section 32). We're currently considering a few changes to rod licences that could start from April 2017, including a licence that allows a maximum of 3 rods as well as the current one for 2, a 365 day licence that lasts for a full year from the date you buy it and a free junior licence for anglers under the age of 16 this could help get more young people fishing and secure the future of the sport. We will advertise our full proposals in the angling press during summer of this year. At this point you will have an opportunity to provide comments. More information is on the Angling Trust website. Been fishing for the past 10 years.took it up when i was 17. This will be my 11th fishing licence. And i am yet to have it checked. I dont ever see anyone even checking around the pools we fish. No one but the men who fish them clean them out. And people i know who have fished them for 20/30 years have never seen anyone stock the pools or even check water conditions. We report the units just up from hear for dumping stuff down the sewers which leak into the pools. There arnt any fishing pegs unless the people who fish once again have dug them out. Cut down brush to get to the pools and make there own paths. So my question is in simple terms why are we giving u millions when u dont put a thousand pound back into the water u clame too? No need for its the law i know thats why we buy the licence. And im refering to the fens pools in the west midlands. Theres 3 big pools and a little stock pond. And theres 5 pegs that the councel have put in. The rest are made by fisher men/ ladys. And this season uv put the cost of the licence up. Its a joke. Iv'e been fishing since 1971, bought my first license in 1980. My point is, i'm an experienced angler and conform to all the new rules and reg's iv'e had my license checked once in all them years and i do not fish anywhere i'm not supposed to yet i pay every time i need a license and the money goes to whatever you say. So get more members to enforce this act and whilst your at it catch the foreigners who sneak on to private waters and take fish by any means they can for taking home to eat. Iv'e seen the stuff they leave behind (tackle) it's barbaric, line that would secure any cruise liner in the docks and hooks that look like anchors. What's more they never get caught and prosecuted to my knowledge. Rant over i'm off tomorrow to get an eight day license and enjoy my week off. I am vice chairman of the broads angling strategy group and we are increasingly concerned that the ea have cut the funding to support project work on the Broads. We are told to look for funding from the angling trust funding pool but in reality this funding is going to commercial venues as a priority. It's time the ea recognised the considerable effort groups like the basg have contributed over the last 16 years to boost rod licence sales and promote angling in the region instead of funneling off our funding and leaving us struggling. Which is exactly why anglers who fish the broads ask where is my licence money going. I dread to think what the future of Angling on the broads Britain's largest freshwater fishery would be like if not for the effort made by the anglers who passionatly work in the BASG give them the recognition they deserve and halt these funding cuts! The Environment Agency acknowledges the excellent work of BASG and we appreciate the contribution of all those involved in supporting angling in the Broads. We intend to continue to work with you going forward, within the resources we have available. You suggest that the Angling Trust’s funding pool is prioritised to commercial fisheries; this impression you have been given is simply not true. I think you are referring to the Angling Improvement Fund that the Angling Trust administer on our behalf. It enables any club or fishery owner, regardless of whether they are Angling Trust members or not, to apply for rod licence money to undertake projects to develop their fishery. Over the last 2 years we have distributed about half a million pounds in this way (and with match funding from the applicant the actual value of the work is more than doubled). More than 100 different sites have benefited from this fund and the majority of the work was at public fisheries or angling clubs with open membership. The fund has just advertised the release of a further £400k so please seek out this announcement and visit the Angling Trust’s website for more information. You also mention that rod licence money has been cut or funnelled elsewhere; in reality in today’s world there is less money to go round so we have had to develop new and innovative ways of working. We also must comply with government spending restrictions, for example the reduction in marketing and promotion work has prevented us from supporting some work that we may have in the past. As a result, to deliver our fisheries outcomes we are increasingly working in partnership with others including the Angling Trust. We have commissioned them to deliver a range of angling services, including angling participation and growing the volunteer bailiff network. We will continue to actively pursue these type of arrangements that offer additional resources, skills and knowledge for fisheries both nationally and at a local level. Thank you for your reply and assurance that you will continue to work with us on these issues. The point you make about the Angling trusts funding pool I don't think can realistically be applied to the Broads and its waters. "It enables any club or fishery owner, regardless of whether they are Angling Trust members or not, to apply for rod licence money to undertake projects to develop their fishery." The very status of the Norfolk Broads as a national park elevates it above this description and the basg is not a club or a fishery owner. When the EA worked with the basg to revise and update the Broads Angling Strategy from the old FAP or fisheries action plan, we fully expected it to be agreed upon, supported and implemented by all parties. We now find ourselves severely restricted in doing this. Implementing it fully should not have to rely on this funding stream alone which we are now being asked to do. If this was simply an issue for a small club or syndicate water then applying for funding and support from the Angling trust would be acceptable but to expect this to apply to the whole of the Broadland area is completely unrealistic. However, we will continue as we have always done to discuss these important issues with the EA and other partners to find solutions and move forward for the good of angling in the region no matter how problematic that will now be. Hi there, awesome article. I really enjoy the outdoors, camping, fishing and hunting. Folks spend far too much time inside watching the TV. Thanks for sharing and giving us inspired. Hi, I live in Wales , and would like to know where my money go,s. Do,s it go to the Environment Agency or The N.R.A. Wales. For the past 5 years or so I have led a group of volunteers regularly clearing all manner of rubbish(including fishing line and floats, shopping trolleys, cans, bottles and plastics-the list is endless!) from a stretch of the River Frome in Bristol. Can you tell me if any monies from Rod Licence income is set aside to support voluntary groups such as ours? We would very much appreciate a little help for example, with purchase of waders and safety items to enable us to continue our work. If such a fund does exist, could you please point me in the direction of advice in this respect? To see what we've been up to, please take some time to visit our Fb page: Frome Fairies.